This is the third post in a new CRFB blog series The Tax Break-Down, which will analyze and review tax breaks under discussion as part of tax reform. In previous posts, we've written about the State & Local Tax Deduction and Last-in-First-Out (LIFO) Accounting rules. For most of the income tax's history, capital gains have been taxed at lower rates than ordinary income, such as wage earnings. This preferential rate is considered to be a tax expenditure, and is one of the most expensive in the tax code, with the highest earners paying about half the taxes on capital income as earned income. 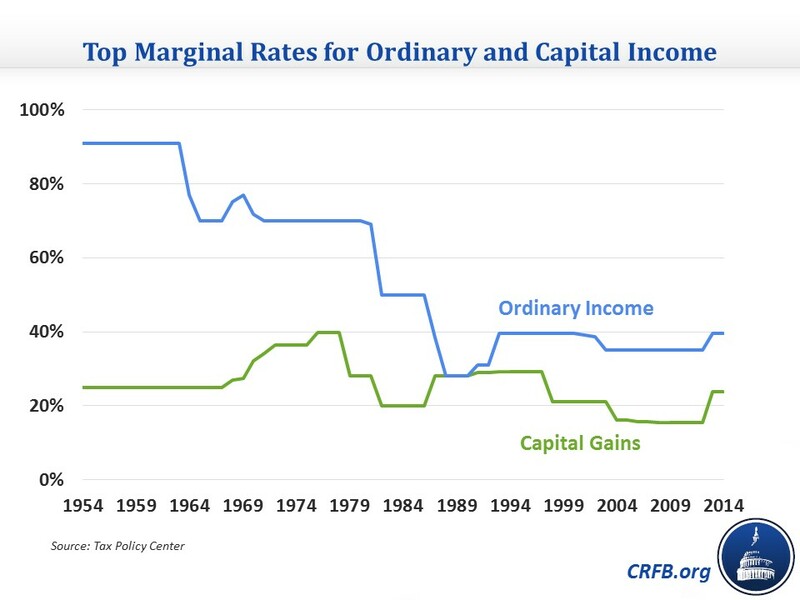 Although the 1986 Tax Reform Act eliminated this preference and taxed capital gains as ordinary income, the tax break re-appeared when ordinary income rates were raised in 1990 and 1993 without similar raises in the capital gains rate and as capital gains rates were reduced in 1997 and 2003. Nearly every OECD country has preferential rates on capital gains, and 11 do not tax capital gains at all. A capital gain is profit from the sale of an asset, like a business, stock, piece of art, or parcel of land. Though assets frequently increase in value, taxes on them are deferred until the item is sold and the profits are realized. If the item is held for less than a year, the gain is taxed at ordinary rates (up to 39.6 percent). If an item is held for over a year, it is taxed at long-term capital gain rates. Taxpayers in the bottom two brackets pay a zero percent rate on these gains, those in the middle brackets pay 15 percent, and those in the top bracket pay 20 percent. Taxpayers with over $200,000 of income (or $250,000 for married couples) will also pay an additional 3.8 percent tax on unearned income starting this year as a result of the Affordable Care Act, bringing the effective top rate up to 23.8 percent. This tax is not paid on the entirety of revenue from an asset sale, but rather the difference in value between when the asset was bought and when it was sold. Although most long-term capital gains are taxed under the 0%, 15%, 20% rate schedule, some capital gains are taxed differently. For example, corporate capital gains are taxed as ordinary income and pay the corporate rate of 35 percent; small business stock and collectibles are taxed at 28 percent, a portion of depreciated real estimate investment is taxed at 25 percent, and a certain amount of the purchase of small business stock can be excluded, further lowering the effective rate. The preferential rate is also extended to some income not universally thought to be capital gains. Royalties by coal companies and sale of livestock, for example, are both counted as long-term capital gains. Certain types of salaries are technically paid out from the sale of stocks and bonds (“carried interest”) can also be counted as capital gains. Below, we answer other questions about the preferential tax rates on capital gains. We will discuss related preferences for dividends and “step up basis” of capital gains at death in a different post. Although CBO does not separate the cost of the preferential rate on capital gains from dividends, by our estimates the capital gains preference costs an average of $120 billion per year from 2013-2017 and will cost about $1 trillion from 2014-2023. Other smaller capital gains preferences, such as exclusions for coal royalties, timber, and agriculture cost about $1 billion per year, combined. Importantly, the value of the capital gains tax preference is significantly higher than the potential revenue raised from eliminating it. Tax expenditure estimates do not account for a taxpayer’s behavior. Because realizing capital gains is completely voluntary, many investors will reduce their realization as the rate goes up, mitigating or possibly even reversing the potential revenue gain. Even though those in bottom brackets receive a large advantage with a zero percent rate, nearly all of the benefit of the reduced rates on capital gains flows to the top of the income spectrum. According to the Tax Policy Center, nearly 95 percent of the benefit of the preferential rate goes to those making over $200,000 per year and more than three-quarters of the benefit goes to those making over $1 million per year. The driver of this regressivity has to do almost entirely with the fact that wealthier Americans own the vast majority of assets in this country. 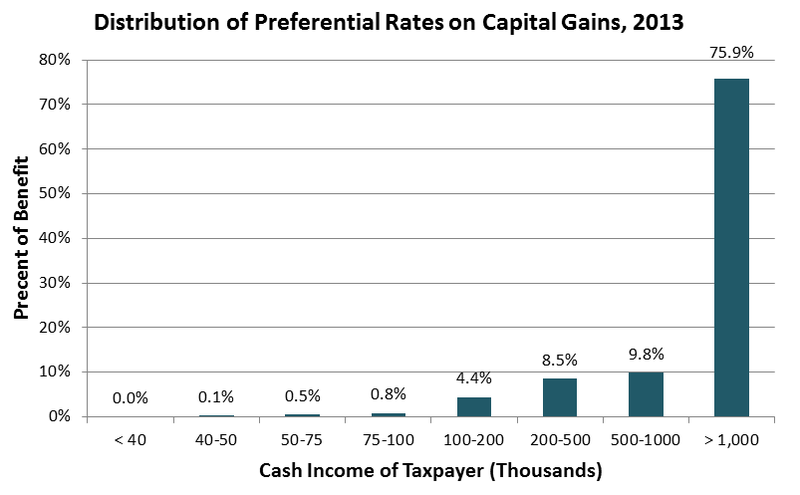 In 2011, half of all capital gains were earned by 0.1 percent of taxpayers. As the Tax Policy Center estimates, taxpayers making under $75,000 see very little (< 0.05 percent) change in their after-tax income, where taxpayers making over $1,000,000 see a 4.7 percent boost in their after-tax income due to these preferential rates. What are the Arguments For and Against Lower Rates on Capital Gains? Proponents of lower rates on capital gains argue they provide an important incentive for investment, which ultimately is the key to long-term growth. Many proponents argue that ideally the United States would shift to a consumption tax with no tax on capital gains, and a preferential rate represents a step in that direction. Proponents also worry that taxing capital gains as ordinary income would effectively lead to “double taxation” since profits are already taxed at the corporate level. In addition, they point out that capital gains levies tax not only on real gains but also increases in asset price due only to inflation. Finally, most observers find that a high level of capital gains tax creates a lock-in effect, where investors who would sell assets keep them instead to avoid taxation. Estimating agencies believe this lock-out effect is so strong that taxing capital gains as ordinary income would actually lose revenue relative to current law. Opponents of the lower rates on capital gains respond that preferential rates are a poorly targeted solution to the much overblown double-taxation issue, that the cost of taxing inflation is largely offset by the benefits of allowing deferral of taxation, and that while there may be a theoretical basis to assume lower capital gains rates will encourage growth, there is little evidence this relationship exists. Critics also argue that multiple rates on different types of assets and income creates unnecessary complexity, encourages tax arbitrage, and distorts investment decisions. Finally, critics argue that lower capital gains rates have been a key driver of growing wealth and income inequality in the United States. A number of options exist to address capital gains preferences in a variety of ways. However, the $1 trillion ten-year cost of the tax preference dramatically overstates the amount of revenue available from modifying the capital gains rate – particularly in isolation. In fact, fully eliminating that tax preference by taxing capital gains at a top rate of 39.6% may actually lose revenue relative to current law. Both JCT and Treasury’s Office of Tax Analysis are believed to rely on a revenue-maximizing rate somewhere around 30 percent. Short of taxing capital gains as ordinary income, a number of other options would broadly modify capital gains taxation. Gains could be taxed as ordinary income with a cap (i.e., at 28%), with an exclusion (i.e., making one-third of gains tax-free), or at a fixed-percentage point differential (i.e., tax capital gains at ordinary income minus 10 percent). Rules for when a sale qualifies as long-term capital gains could also change, either broadly by modifying the one-year holding period or narrowly by changing the special rules for certain kinds of income, like coal royalties and livestock. None of the below options modify the 3.8 percent surtax on investment income. * This estimate was prepared at our request by Jane Gravelle, Senior Specialist in Economic Policy at the Congressional Research Service, but does not reflect the views of the Congressional Research Service. The range reflect the difference between assuming revenue maximizing rates (including the surtax) of 28.5 percent and 32 percent. † Both of these options will raise the top effective tax rate on capital gains to around the revenue-maximizing rate. What Have Tax Reform Plans Done With Capital Gains Rates? Two bipartisan deficit reduction plans, proposed by the Fiscal Commission and the Dominici-Rivlin panel, recommended eliminating the preferential rate for capital gains altogether. While both plans would tax capital gains as ordinary income, they would also both reduce the top ordinary rate, to 28 percent. Other plans have chosen to revise the tax break without fully eliminating it. The tax reform plan by Senators Wyden and Gregg replaced it with a partial exclusion. Capital gains would be taxed normally, but 35 percent would be excluded from income; with a top rate of 35 percent, the Wyden-Gregg plan had a top capital gains rate of 22.75 percent. The 2005 Tax Reform panel recommended either keeping the rate at 15 percent, or taxing capital gains as ordinary income with a 75 percent exclusion for capital gains from U.S. companies, so the effective rate would be between 3.75 and 8.25 percent. The Center for American Progress would tax capital gains as ordinary income with a 24.2 percent cap (28 percent including the surtax). The Congressional Progressive Caucus would tax all capital gains as ordinary income, and raise the top rate above 45 percent for incomes over $1 million. At the other end of the spectrum, The American Enterprise Institute would shift towards a consumption tax, entirely eliminating taxes on capital gains, dividends, and other forms of saving. The President’s Framework on Business Tax Reform, though not focused on the individual side of the tax code, did recommend repealing the carried interest loophole. 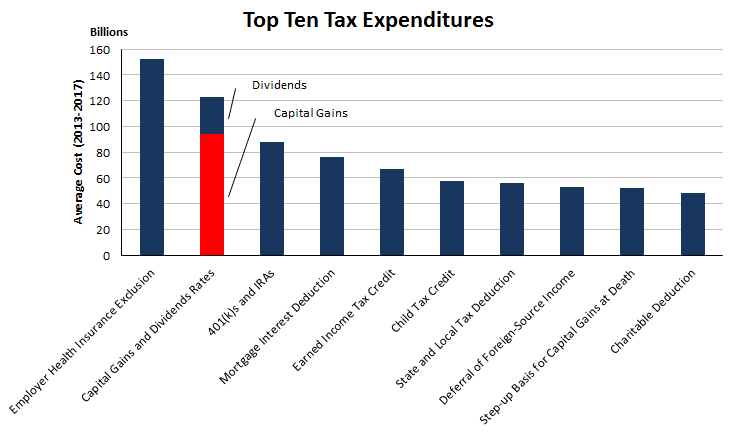 Tax Policy Center - Capital Gains and Dividends: What is the effect of a lower tax rate? Martin Sullivan – Are Capital Gains Double Taxed? As we’ve written before, reducing the tax preference for capital gains in concert with other changes to the tax code offers an opportunity to tackle three, sometimes opposing goals: increasing revenue, increase or maintain progressivity, and lower tax rates. However, raising capital gain rates could disincentivize some investment and increase the severity of certain double taxation while raising a relatively small amount of revenue. Lawmakers will have to carefully consider impacts on saving and investment, but taking the capital gains preference off the table would make the rest of tax reform that much harder. See other posts in The Tax Break-Down here. Last week, we wrote about the State & Local Tax Deduction and Last-in-First-Out (LIFO) Accounting rules.